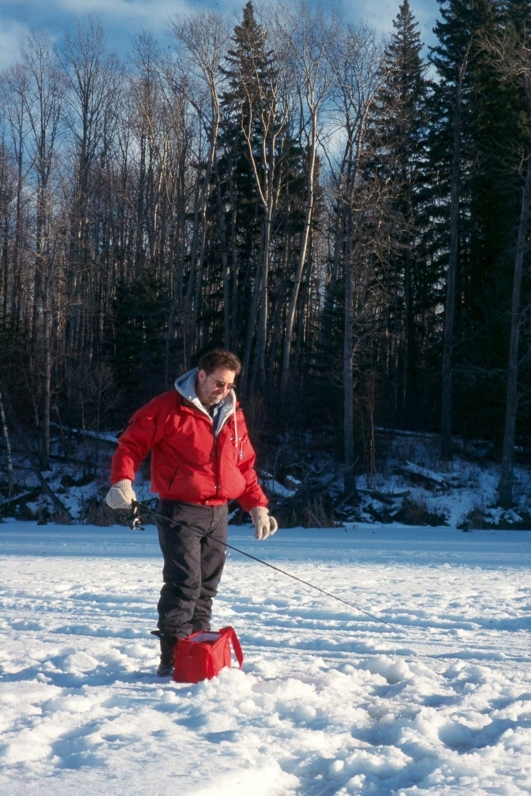 During ice fishing season, as much any other time of year, anglers will benefit by matching fishing tackle to the species being sought. This can and in most cases will, dramatically improve results. The interesting thing I've found is that there is no one perfect system and there is no one perfect line. The following are my preferences for lines and rods for each species and the reasons why. We'll start with mono line and then look at superlines. The advantage of mono is that it stretches and therefore, acts like a shock absorber. The light action rod further enhances this shock-absorbing theme through its substantial bend and flex. This gives us a system that's designed to give and take, tempering the explosive power of a hard running fish while still maintaining that all important continuous contact. Stretch and shock absorption performs a double duty in that it maintains a soft, but steady pressure. 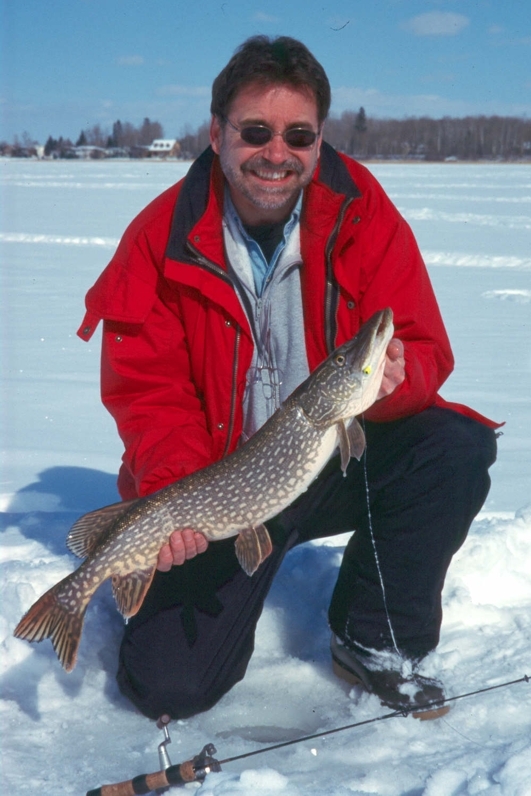 The benefit of light pressure is huge on a species like trout and lake whitefish. The soft pressure and easy flex is largely responsible for keeping hooks from pulling out of their soft mouths. Whitefish are a prime candidate for the light action rods for their soft mouths. Hooks can and do pull through the mouth tissue quite easily if too much pressure is applied. The trout, on the other hand, are athletic and are capable of wild runs, last minute body rolls and twists that would pull out many hooks if there weren't some shock absorption going on. 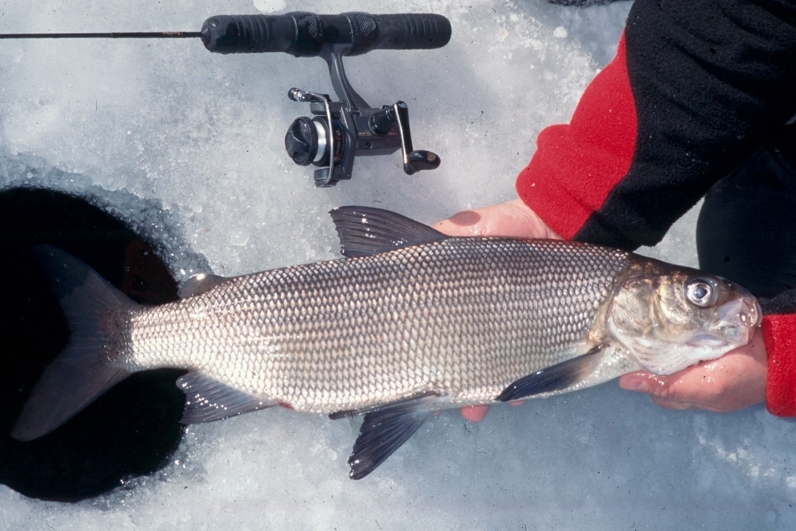 My favorite mono for trout and whitefish is either four or six pound test. The advantage of superlines is that they don't stretch. 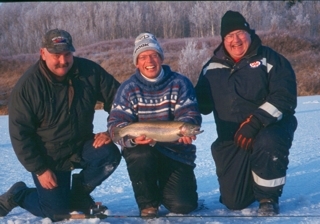 The advantage of a medium to medium heavy rod is a positive hookset and the muscle to bring in big fish. My favorite superline is Berkley's Fireline. No stretch is exactly the opposite of mono, but no stretch has its place. Deep water jigging comes to mind. A light jig dropped 20 feet or more below makes it increasingly hard for strike detection. But when the stretch factor is removed, it becomes much easier to pick up deep-water bites. The trick is to use the lightest superline for the situation at hand. The thin line makes it hard for fish to see and easier for us anglers to pick up bites. When I go deep with light jigs, I use four or six pound Fireline. When I move up, using larger baits in search of bigger fish by I'll switch all the way up to 14 pound Fireline so I've got the muscle to set the hook and wrestle the fish in. No stretch also has its advantage in the hook setting department. No stretch means immediate hooksets and solid connections. When it comes to setting hooks into hard mouths, no stretch and a stronger rod is the difference between trying to set the hook and setting the hook. No stretch means good hook penetration and more fish caught. All of the above three species can grow big and have hard mouths. This plays into the strengths of using no stretch line and heavier action rods. 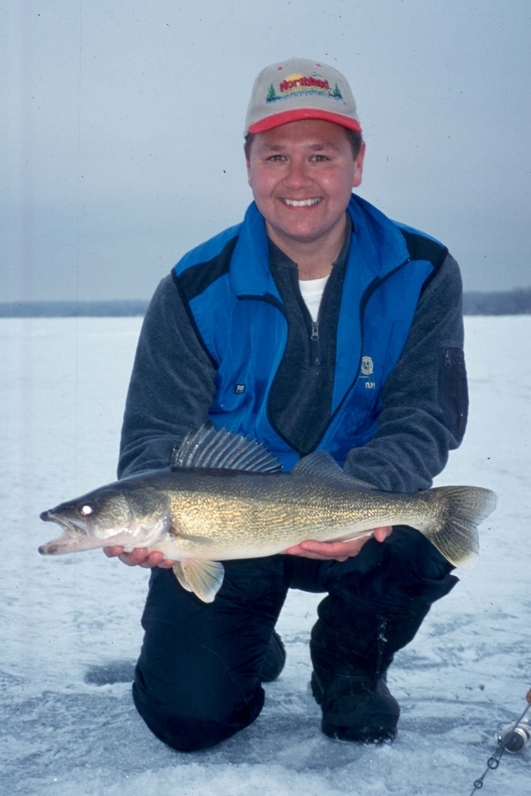 The line will help in strike detection and hook penetration for deep-water walleye, often found in 20 feet or more. This line is also particularly handy in picking up lake trout bites, which can happen in a hundred feet of water or more. 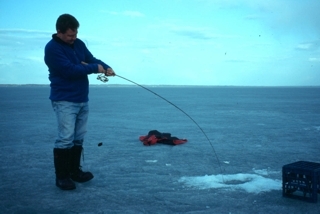 Many of the lakers caught through the ice at Cold Lake are located that deep. Fireline also has an abrasion tolerance well beyond mono, which means it can often, but not always; withstand a direct hit from a pike. That said, when I'm targeting Northerns, I'll tie on a small, thin black steel leader, which takes their nasty teeth right out of the equation. 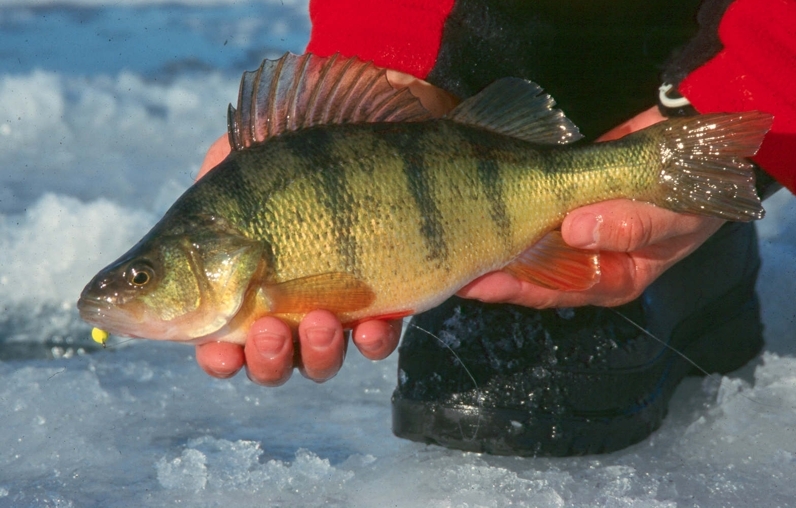 Perch are a funny because ice fishing for them often means finding deep water to catch this little, light-biting critter. Mono down deep makes it next to impossible to pick up a bite due to all the line stretch. Using light Fireline down deep can also be a problem as the light 1/64 ounce jigs simply aren't heavy enough to take the hook down to the fish and allow for effective strike detection. Having confronted this problem head on, here are a couple of my solutions. The first is an old fashion solution. I've added a good-sized split shot three feet up on four-pound Fireline, which is enough weight to pull the line tight. With a tight line there is now a direct connection to the hook and any light biting perch. The second solution is a little more electronic and it involves fish TV. If it is within your means, beg, borrow or buy an Aqua-Vu. It's an underwater camera that allows you to see...well...underwater. What I do is drill two holes five feet apart; drop the Aqua-Vu down one hole to watch my bait in the other. With this set up I can actually watch the perch come in to bite my hook. If they looked small, I can pull the hook away and if they are big, I can add a subtle lift or wiggle to entice them to bite. There's a lot more to this tackle-matching thing, but this is a great place to start. Matching tackle to the fish being sought will definitely improve your fishing.